Generally, the HR department of the company is considered as a taken granted department. In the form of functioning of the company or a business, HR department plays a very important role, but most of the time it seems as all the managers and rest of staff tries to dominate the HR department by their own way. The HR department handles all the human resource management of the company where in which all the employee activities are considered. The HR department of the company is one of the main source of manpower in a company, it handles and maintains all the human resource management activities. And there are certain specific strengths that an HR leader holds on, they are as follows. There is a possibility that in every company or in every business, HR leaders face a certain level of competence in their department and with the rest of the department. But eventually, the main thing to focus on would be their level of development and involvement in learning resourcing materials. The main importance or strength that an HR leader can handle is their development and coaching skill which helps all the employees of the company to work better in their department. The main thing an HR leader needs to understand about developing is to build their communication level so that they can start their healthy relationship with the rest of the people. Most of the time it is possible that an employer working in another department would end up being in a bad relationship with others. But in the case of an HR leader, they may start their communication in a better manner than the rest of the department in the office. An HR leader is a person who is being expected of working his / her duties without any flaw and mistakes in their work order. Most of the employees of the company rely on their HR department for every single work they need to complete. It is even possible that an HR leader is expected of being a role model for the rest of the employees in the office. Therefore, it is a very common strength that an HR leader consists of in them. An HR leader might be having a certain level of functional knowledge that every business needs to be successful in their business activities. These HR leaders are considered as a strong pillar of every business or a company. And certainly will be treated very respectfully for the level of knowledge and expertise they hold on. These HR leaders handle all the functional departments of the company. As an HR leader holds such knowledge and expertise regarding functional departments, they even possesses all the authority of running such departments. As mentioned above, if an HR leader possesses a certain level of strengths being in the HR department, then there is even a possibility that an HR leader can possess certain levels of weakness which is considered as a risk for the company or business. And they are as follows. As the HR department handles and maintains all the internal affairs of a company or a business, but it is difficult for an HR leader to maintain external affairs. As much as the rest of the department, external involvement is the factor that the HR department lacks in their level of customer interaction. Most of the nature of work an HR leader handles would be internal than external affairs. Most of the duties that an HR leader handles would be more of day to day work. And these HR departments play a coincidental part of the business in their delivered duties. Therefore, it is possible that most of the department of HR lacks in their strategic perspective as compared to the rest of the department. And because of such involvement in strategic perspective, an HR leader takes things with a negative approach when it comes to the future. All the employees working in the HR department have that behavioural problem with the way of their work. As we all know that processing a solution for a problem may take its own time to solve, but in such cases like an official emergency, one needs to show little creativity to find the best problem-solving strategy. And at that point of time, there is a possibility that an HR leader may not deliver quick solutions for the problem. They tend to follow a certain level of procedure for every problem. Most of the time we experience a certain kind of fixed and constant reactions from an HR leader. For example, if there are situations when a company or a business is suffering some loss or risk, it is time to follow some risk baring techniques in the company, then at that time it is common to hear this fixed statement for the HR department that “ it is not that easy and we need to slow down the process, because it may take more time than expected”. Therefore, it is understandable that most of the HR department work according to their limited resistance policy created by their owners. And the bottom line is that most of the successful entrepreneurs or businessman worked in the HR departments. The HR department provides exposure to successful business maintenance. 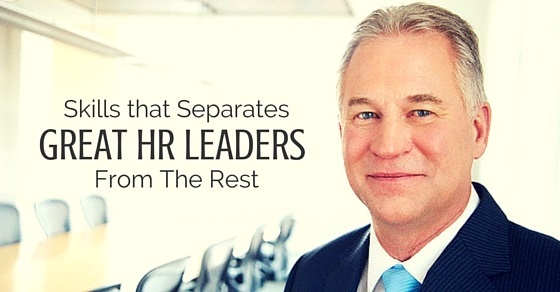 These successful HR leaders are no less from other leaders. There may be a possibility that when it comes to a difficult situation an HR leader may take a bit more time to solve the problem but no one can deny that an HR leader can handle situations in a better manner than any other department employee. Therefore, in this discussion over the skills which differentiates great HR leaders from the rest, it is understandable that even after availing certain weakness, it is accepted that an HR leader makes a successful businessman in their future ventures. And if anyone needs to keep that in mind, then they can go through all the above mentioned skills that separate a great HR leader from the rest of the people.